The model S-7 Dual Lane Scale System share many of the same basic characteristics of the S-4. A very accurate and easy to use Logical Controller II allows for three different modes of operation. In simultaneous dump the machine fills both weigh hoppers at the same time, allowing for twice as much product flow as our S-4. In individual dump the machine dumps whichever weigh hopper is at weight. This gives twice the speed of our S-4 machine. Finally the model S-7 can mix products. 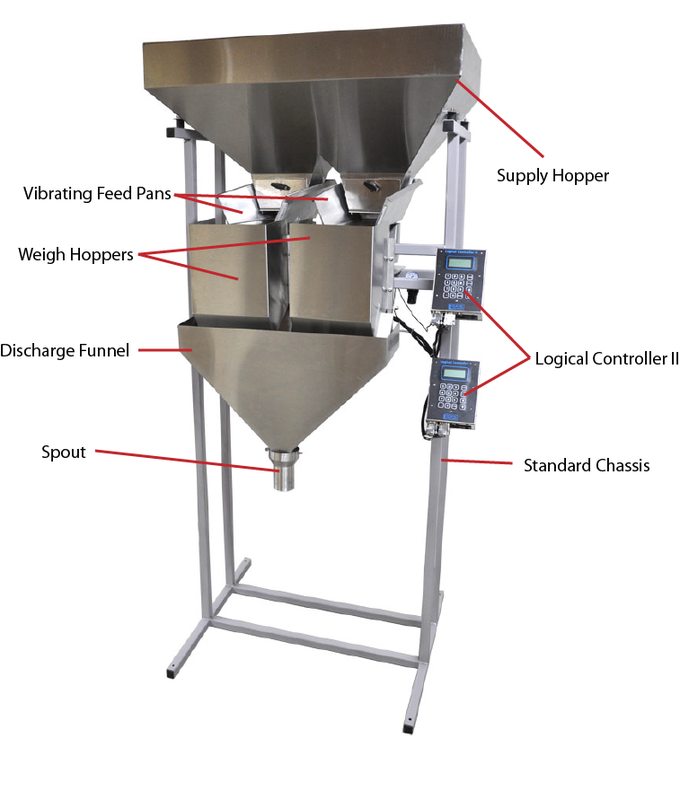 The S-7 Dual Logical Controller II System can be set to weigh two completely different products at different weights to easily mix products into one container. Scale Total Weight: 225 lbs. $12,000.00 Standard S-7, F.O.B. Charlotte, VT 05445 — Get an instant online quote using our Quote Generator! The S-7 typically requires a one month lead time.